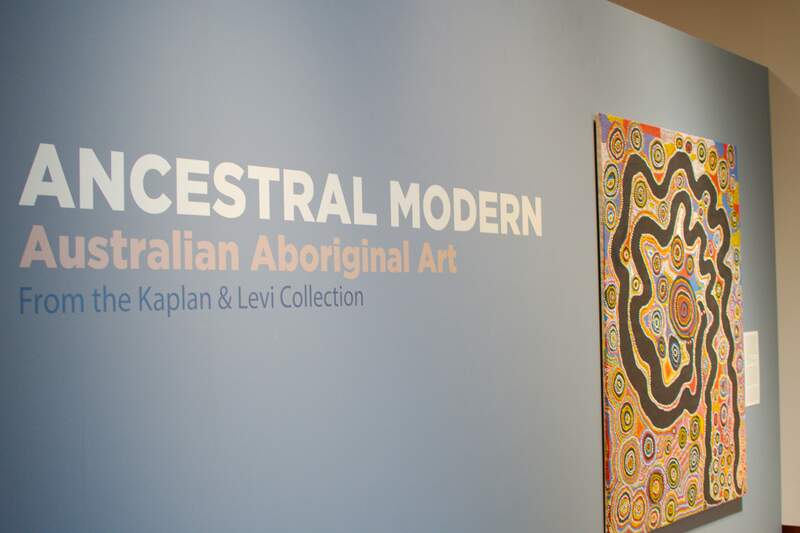 The Chazen Museum of Art’s exhibit “Ancestral Modern: Australian Aboriginal Art,” was recently on display from January 26 to April 22. 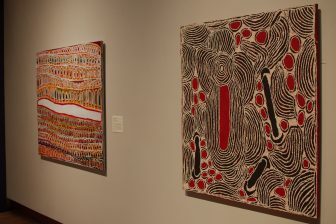 The show displayed a diverse body of work from artists throughout Australia, including the Great Sandy Desert, the Gibson Desert and Tanami Desert, among other places. Robert Kaplan and Margaret Levi purchased the collection’s pieces during their travels to the region. 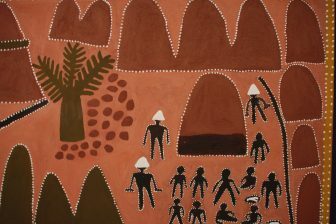 When entering the exhibition, the first piece a viewer notices is called “Wati Kutjara” (Two Men Story) 2003, by the Spinifex Men’s Collaborative. This painting is vibrant and bright, with two black wavy vines encircling countless concentric circles made up of colorful dots. 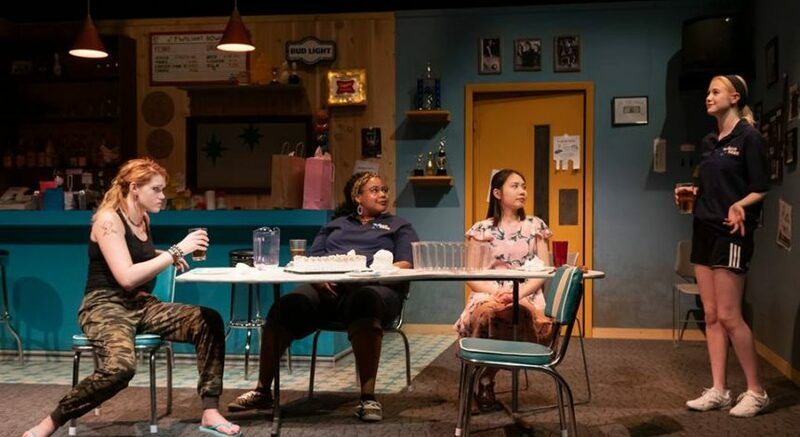 The viewer may have any number of interpretations of this piece, but it actually references a complex story about a father and son relationship between two snakes and their community, which the black lines symbolize. Like this artwork, many of the pieces in the collection have equally interesting stories that accompany the work itself, such as Tommy Mitchell’s “Walu.” This piece is similarly composed of numerous tiny colorful dots. The forms these lines create are wave-like and allude to the wind. The story for this piece discusses a greedy young boy transforming into wind as a consequence for his actions. Knowing this information, the work begins to feel alive, as though one is watching this sudden movement appear in real time. One of the largest pieces in the collection is called “Leaves” and is painted by Gloria Tamerr Petyarr. This piece is painted with seemingly infinite stroked of white paint with a black background. The end result is an incredible piece of art that captures the viewer’s attention with its motion and light. While viewing the work, one can truly experience the leaves blowing in the wind. Much of the work in the latter portion of the exhibit delves into the subject of death and the passing of time. Several pieces center on the idea of the dead reintegrating with nature and going back to the earth, while others focus on seasonal elements in nature. “Gunungu the Black-Headed Python” by George Milpurrurru depicts a python that controls each season’s changes. The piece is divided into two halves, where the top portion features a large snake facing upward and the lower half shows three snakes also facing upward toward the larger snake above. The reptiles all have branches and trees behind them, suggesting their influence on the environment. Unlike the initial pieces in the collection, this has softer colors — mostly shades of brown, black and yellow — yet it has intricate line designs and patterns. John Mawurndjul’s “Mardayin Design” and Tjumpo Tjapanangka’s “Wati Kutjarra” focus on the natural landscapes in their cultures, and each piece uses bright colors and symmetry to convey details about these places in an abstract way. The artwork takes on two meanings — the first shifts between individual viewers, while the second is revealed through the stories accompanying each work. This exhibit successfully blends work from many different artists around Australia, incorporating diverse styles and focuses. 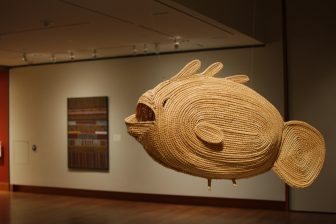 Experiencing the exhibit allows one to have a glimpse of the many stories told in Aboriginal culture, while simultaneously viewing the end result of incredibly skilled and creative work. Having the opportunity to see the vibrant and detailed pieces changes one’s perspective and broadens our awareness of the Aboriginal community.